If a new Raspbian release appears now, then the previous release is out of date. In order to enjoy the new versions, you have to make a release change. This is an upgrade process that can take several hours, depending on the system. 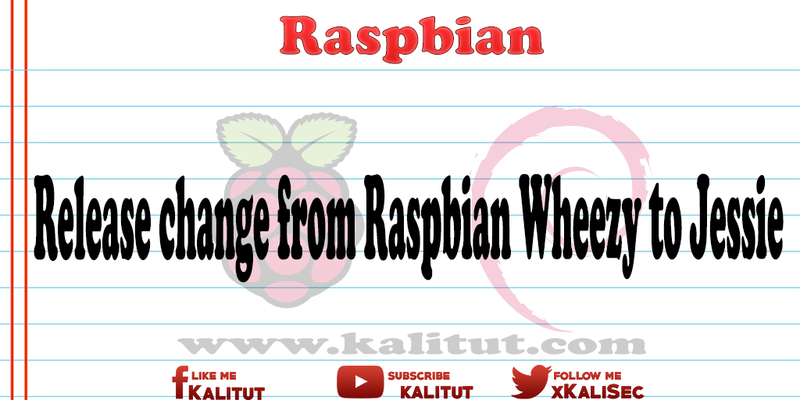 The following article is about how to update Raspbian "Wheezy" to the "Jessie" release. Why you should make a release change and why NOT ! What are Wheezy and Jessie? "Wheezy" and "Jessie" are release names for the Linux distribution "Debian". For Raspberry Pi this Linux distribution has been adapted and is called "Raspbian". Again, these release names apply. The release is similar to an operating system version of Microsoft, such as Windows XP, Vista, 7, 8 or 10. Since 27.04.2015 the Debian-Release "Jessie" is officially "stable". This means that a new release of the Debian developers has been released. This will make the previous release ("Wheezy") automatically "oldstable". That has consequences. Software updates are only available for the new or current release. Exceptions are security updates and one or the other bug fix. As a result, a system becomes obsolete over time because it no longer receives updates. If you want to do the upgrade on a running system, you should first read the release notes. In the release notes is also what to consider when upgrading from "Wheezy" to "Jessie". A release change should be considered well and make appropriate preparations. Therefore at this point the hint to make a backup before. If something goes wrong later or not at all, then you can go back to the old state or re-create overridden configuration files. Note: For a release change you should bring a little time, because a lot of packages must be downloaded and then installed. In addition, some installations expect user confirmation because some important default settings have changed. How long it takes depends on how extensive the software installation is and how fast the system is. As a rule, several hundred packages and thus several thousand files are exchanged. In addition, some things will be reconfigured. You have to expect that a release update can take several hours. An upgrade needs additional storage space. Therefore one must ensure by "raspi-config" that also the full storage capacity of the memory card is used. In addition, UTF-8 must be set as a character set, otherwise there will be problems with the upgrade. Furthermore one should carry out the update one on the console and not in the terminal on the desktop. The upgrade would be conceivable via SSH. If, then over LAN, not WLAN. Ongoing services are either limited or unavailable during the upgrade or during the release change. Some of them are only available after a final restart. You should take the time to keep track of the update at least temporarily because there are always requests for changed configuration files that need to be confirmed or rejected to keep the process running. It is a good idea to make sure that there are no damaged packages. If no issue appears, everything is fine and you can proceed with the release change without hesitation. If an issue appears, then these issues must first be resolved or these messages be investigated. Before we start, we will check if there is enough space left. Of course, how much additional memory the downloaded packages need depends on the installed software. However, there should be enough storage space for an upgrade at all possible. It should already be one or two gigabytes of free space. What you should do in any case, to get more storage capacity, is to clear the package cache. As a rule, you will no longer need the packages contained in it after a release change. The upgrade or release change does not take place automatically on Raspbian, but only after an adjustment of the package sources. For this you have to open and edit the following file. Before all other lines you put a "#". Then you delete old package sources in the directory "/etc/apt/sources.list.d/". After changing the package sources, the list of available packages must be updated. It is important to note that all repositories must be downloaded and read without errors. If there are error messages, then you should first eliminate these problems. Ignoring this and moving on to the next step can lead to a faulty release. The release notes advise dividing up the release change and first of all bringing all installed packages up to date. The next step will be the actual release upgrade and will update Raspbian to the new release. This step also updates the packages for which additional software needs to be installed or for which other packages come. Many packages are downloaded and then installed. This upgrade takes a while and there may be interruptions again and again. Therefore, it is important to watch the upgrade and make a selection if necessary. In any case, you will be offered new configuration files. To limit the subsequent configuration effort, you should keep the old settings. It can not hurt to take notes in parallel via new configuration files, so that you can know later where a configuration needs to be checked. New versions of already installed packages that the system can not update without changing the status of another package will not be updated. In that case the dependencies of the packages have to be corrected. Under certain circumstances, some packages will be additionally installed. Sometimes you have to start the upgrade process again because it has ended prematurely for some reason. Only when no further installations are performed (0 updated, 0 reinstalled, 0 removed and 0 not updated), a complete release change has been made. Then you should uninstall the packages that are no longer needed and delete the parcels, which are outdated. Then you can remove obsolete init scripts and configuration files from the old packages. Now the system should run with the new release. The next steps are to check all the functions you expect. If necessary, configuration files must be adapted. After the release change you will usually encounter one or the other problem. If there is no fundamental problem, you get almost all problems solved. As a rule you will have to deal with configuration files and have to install one or the other package.